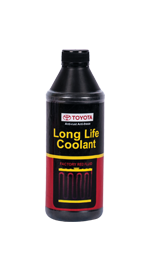 Genuine Toyota premixed antirust & anti-freeze/super Long Life coolant is a new generation ethylene glycol-based premium engine coolant, offering excellent corrosion protection formulated. Specially for all Toyota engines (freeze-ups to 37 C) and meet all TOYOTA warranty requirements. For vehicles filled with Super Long Life Coolant at the plant, it is highly recommended that Super Long Life Coolant be used for maintenance. Install TOYOTA Pre-mixed Anti-rust, Antifreeze/Super Long Life Coolant. No dilution necessary. See Toyota Owner’s Manual for specific directions. Dispose of Pre-mixed anti-rust Anti-freeze/Super Long Life Coolant. ACCORDING TO LOCAL LAWS AND REGULATIONS. DO NOT DRAIN ON GROUND OR INTO STORM DRAINAGE SYSTEMS. Follow vehicle manufacturer’s recommendation when adding brake fluid. 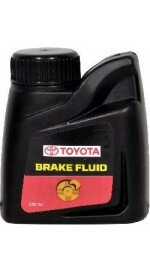 Keep brake fluid clean & dry. Contamination with dirt, water, petroleum products or any other material may lead to brake failure or costly repairs. Store only in original container. Keep container clean and tightly closed to prevent absorption of moisture. Conforms to Federal Motor Safety Standard 116. Meets SAE J1703 and W-B-680 specification WET ERBP 140 C(284F) MIN.